Chunyu Qiong can use a peach as wine. When he uses wine, the effect lasts until the end of his turn. When Chunyu Qiong's judgments are clubs, they are treated as diamonds. 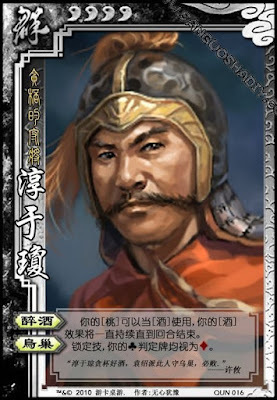 When Chunyu Qiong uses Wine during his turn, the effects are not lost after he attacks. If he attacks more than once during his turn, each one of those attacks can have the boosted effect of the wine.